This film wasn’t what I expected. Not at all. This Garden State for the current generation definitely resonates with high schoolers, as so many students told me to see it. The characters are strong-willed yet insecure – the same paradox so many live in. Each longs to be seen and known yet holds to the wall hiding truckloads of hurt. Voila: wallflower. Stand out performances from each of these actors made the film. And, it was beautifully directed by its screenwriter who also wrote the original novel. That is rare. Loyalty and friendship frames the classic parentless 90’s high school paradigm as these teens deal with life together. They give meaningful gifts to one another, and as they do, they give pieces of themselves. This is beautiful. Paul Rudd surprises as the straight man. Remove his comedy and he inspires. Joan Cusack is always the favorite face to grace the screen, beautiful and trustworthy. Two unnecessary elements stand out. No need for Rocky Horror scenes, which added nothing to the story, except to add to the already sexually charged atmosphere. High schoolers are hormonal. That’s a given. Also, the scenes of drug use flowed with too much normalcy becoming distracting and disconcerting. Despite those scenes, I felt known through this film. I left in tears wondering how I could write about a film that wrecks me so. This is real. The ache resounds. Somehow when pain is shared, we no longer feel alone. I can’t save anyone either, Charlie. But somehow as we share our messy selves with others, as we learn to love and to forgive, as we allow ourselves to be forgiven by God and everyone, we do, I agree, taste the infinite. If you read the book you’d understand that drugs played a major role as well as The Rocky Horror Picture Show, which was a big part of their lives – please don’t ruin this for me by being ignorant as well as a prude. Don’t let your perceptions be ruled or ruined by mine. Prude or not, this was my take. I do believe that films, even adaptations, should be stand alone. You’re right in that I do need to read the book to better understand these portions of the film. I look forward to the read. I want to watch this film so badly and now after reading this I want it even more! 8.5 on imdb is NO JOKE. 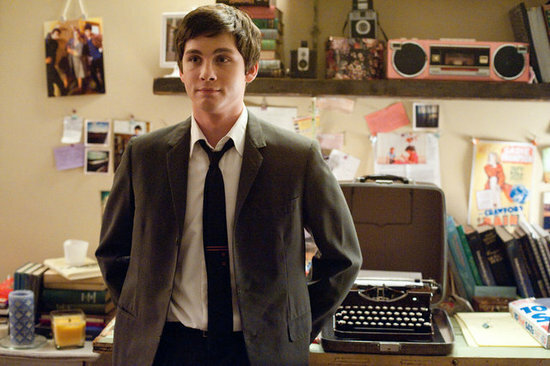 isn’t logan lerman just the best? this one haunted me. of course i knew it would.